Get tips for talking with your kids. Do you worry your child may be being bullied? Would they tell you if they were? 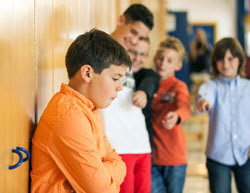 Bullying can be hard for kids to talk about and hard for parents to detect. The free KnowBullying app for smartphones can help. It provides conversation starters for talking with your kids, and tips for dealing with bullying effectively. It has a section just for educators too. Watch this KnowBullying video to learn more. And remember, cyberbullying is a big concern now too. Learn ways you can help prevent it and keep your kids safe from bullying online and in social media.